How do you avoid investing in a Ponzi scheme? It's very simple -- Avoid private equity. Only invest in securities that trade on the stock market and have a ticker symbol that can be researched on Yahoo Finance. Place trades through bellwether financial services companies like E Trade, AmeriTrade, Scottrade or Vanguard. Do not transfer money or write checks out to any other entity. Bernie Madoff was not just a stock broker, investment adviser, and financier but was once a chairman of the NASDAQ stock exchange. Madoff was also running a $64.8 billion fraud scheme, ripping off 4,800 clients. Claudio Osorio was named was named “Entrepreneur of the Year” by Ernst & Young in 1997. Former Florida Governor Jeb Bush was a consultant to Osorio and Osorio’s companies. Osorio held fundraisers for Barack Obama and Hilliary Clinton at his mansion. Osorio was running a 50 million dollar fraud scheme. Nicholas Cosmo ran a company called Agape World which was a $370–413 million Ponzi scheme. Not only did the company have a spotless record with the Better Business Bureau and Dun & Bradstreet, but the company was on Entrepreneur Magazine's Hot 100 list of “World's Most Admired Companies”. The lesson learned is never be tempted to violate the basic rules of investing, no matter how squeaky clean an investment opportunity checks out. The SEC alleges that Thomas L. Mitchell and his firm Mitchell, Porter & Williams, Inc. (MPW), solicited clients to invest their retirement money in promissory notes offered by two other entities he operates (Adivanala AA Investment Trust and AB3, Inc.). The SEC alleges that Mitchell met with the prospective clients and encouraged them to take their retirement pensions as a lump-sum payment rather than a monthly annuity, and give him the money to manage for them. Rather than investing the money into stock, bonds or real estate as promised, Mitchell instead orchestrated a Ponzi scheme in which money from new investors was used to pay interest to existing investors. UPDATE Aug 2011: According to this article Thomas L. Mitchell has been sentenced to 9 years in prison for defrauding retirees. This case illustrates the importance of only investing through a bellwether financial services company such as ETrade, AmeriTrade, Scottrade, Vanguard, etc. Nobody else should ever control or have access to your money. A deep discount brokerage merely provides trading services while you do-it-yourself. They don't provide one-on-on advice and actively push products on you like a full service brokerage firm (think Merril Lynch) or independent management firm (which could be a Ponzi scene). Mitchell, Porter & Williams was able to hook in retired Los Angeles area bus operators, who were referred to the firm by former colleagues. This illustrates the importance of never letting down your guard just because your fellow employees, group of trusted friends or family give it the seal of approval. The greatest rogues are they who talk most of their honesty. 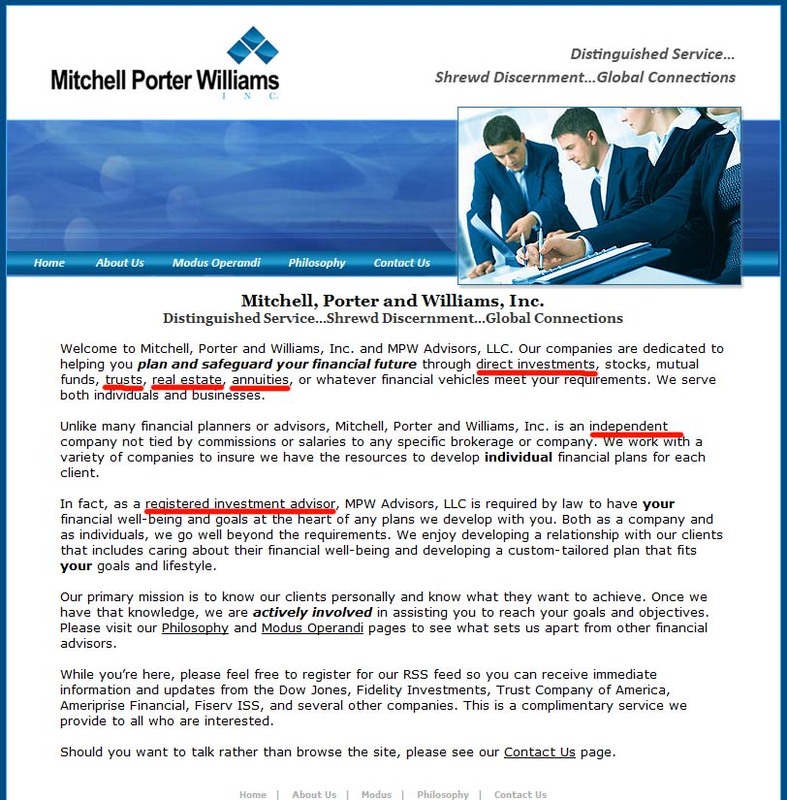 Below are snapshots of pages from Thomas Mitchell's actual investment firm website. It looks very professional, they boast of 50 years of investment experience, and have lots of fancy language like "modus operandi" and "distinguished service", "shrewd discernment", and "global connections". This is a prime example of why fancy talk means absolutely nothing. As discussed on the main page the only fat checks you write should be paid to the order of your deep discount brokerage firm -- Not these clowns or any other investment advisers! A financial planner should only give you PURE ADVICE (on buying all or mostly stocks), then you execute the trades yourself via your deep discount brokerage firm. Never hand your investment money over to any investment planning firm or individual. Steer clear of investment advisors who aren't mainly recommending index funds. Avoid private equity and especially those dreaded annuities which this firm appears to pitch. As previously discussed, all too often investors let their guard down for various reasons, such as when they do business with a company or person who is a friend, someone nice, professional, a philanthropist, well credentialed, well certified, well established, young or old, famous, high profile or well connected. These attributes mean nothing. Just because they might be a "registered investment advisor" means nothing! Sometimes fiduciaries break the law. On their very professional looking website they also boast of having a combined experience of more than 50 years. This also means nothing. ABOVE: This firm boasts that they are not tied by commissions or salaries to any company, however on the same page they announce that they push not just "retail" investment products but inferior products such as mutual funds (presumably actively managed) and annuities which are all known to pay fat commissions to the brokers who push them. So right off the top this raises a cloud of suspicion as to whether these guys are really fiduciary advisers rather than merely "brokers" (salesmen). "Direct investments" suggests that they are pushing private equity -- another big no no. 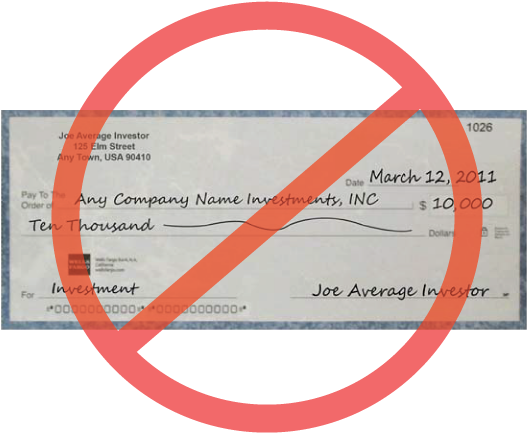 Always remember that the only fat checks you write should be paid to the order of your deep discount brokerage firm! This line of defense alone would have protected investors from Mitchell, Porter & Williams, Inc.